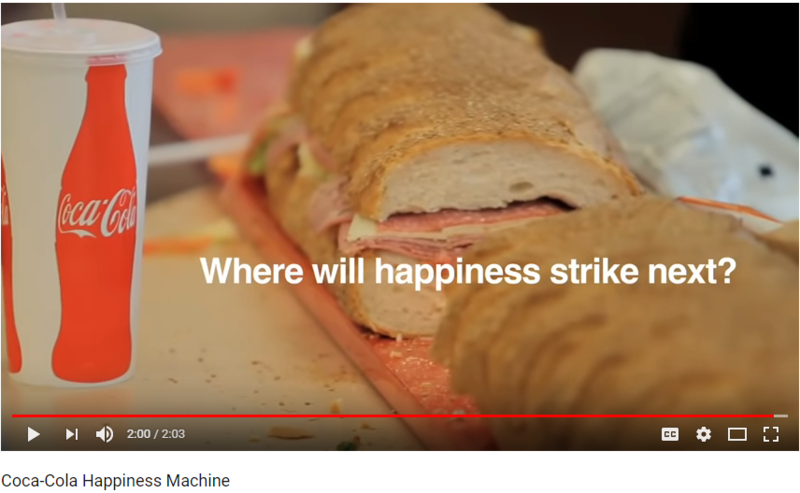 Coca-Cola Happiness Machine - Lessons for Learning. Today's "Lessons for Learning" - leveraging marketing techniques for more Engaging & Impactful Learning - comes from Coca-Cola, one of the great leaders in marketing. Coca-Cola customized one of their vending machines on a college campus, and staffed it, to provide unexpected results that required sharing with others, such as multiple bottles of Coke, large pizzas and over-sized sandwiches. The edited YouTube video highlights the collective reactions of the college students present. I frequently speak about clarifying Learners Expectations over Learning Objectives. Until we identify those expectations and meet those, at a minimum, people will be dissatisfied with our learning programs. Do we clearly connect the dots between what someone wants, or needs, to achieve from our training and what we actually deliver. Coca-Cola in this promotion goes above and beyond that, but in a way that reinforces their branding and positioning: Share a Coke. Experience Happiness. The tapping into emotions, providing experiences of happiness which are associated with their brand is key. Note, it isn't so much the product within the bottle, but rather the interpersonal experiences and emotions people have which are initiated by seeking out the product. So in Learning, could we focus less on eLearning courses, and more on incorporating elements that reinforce company culture which require human interaction? Could we work into our efforts elements which provide a positive reward afterwards. Ok, we have to watch HR and fairness requirements. Still, why not provide a live cam celebration of new employees finishing on-boarding training, sneaking into the last part of it something like, "Now, go out the door with the 'Next' sign" - and people are waiting with balloons and swag, etc., which is streamed on the intranet with the opportunity to wish congratulations and welcome. Then make sure to provide other positive experiences at various stages, or random days. Turn learning into a celebration and promote success but in a way that resonates with peoples day-to-day life, that relates to the sorts of celebrations people are seeing on YouTube.